Regular visitors to this blog may recall that back in July I wrote a review about a miniatures skirmish-level war game called Anima Tactics. In that review I talked about the "light" and "dark" starter sets that you can purchase, and how they do not provide the best possible introduction to what is actually a rather splendid little game. If you don't recall the review, go check it out now. Go on. I'll wait here. Right. You all up to date? So, this is just a little update review to get down my opinions on the book. 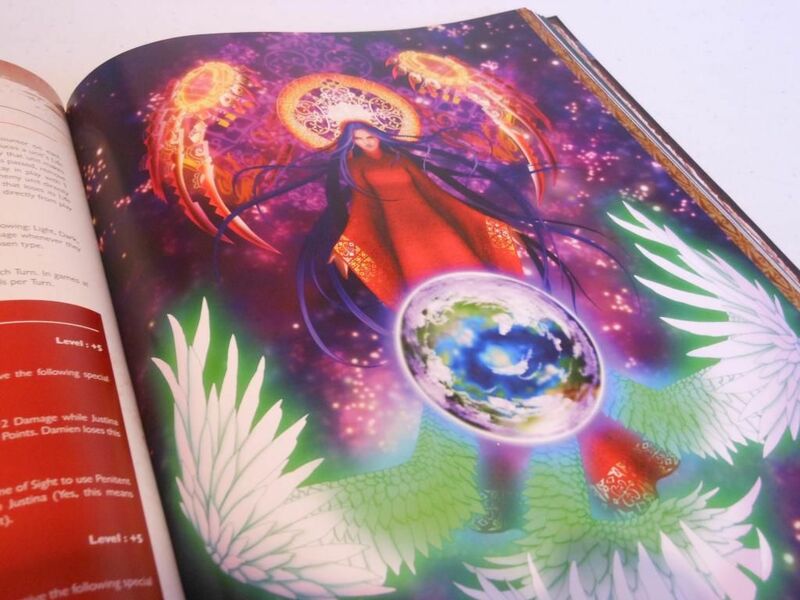 Now, the first thing to note is that the book is stunning. 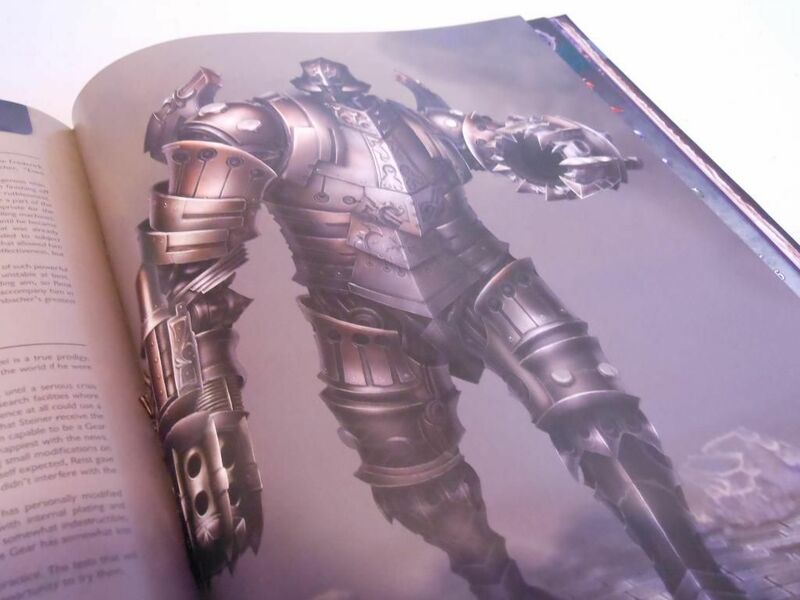 It is full of glorious artwork, most of it in full-colour, depicting the various characters from the game. Admittedly, a lot of the artwork is the same stuff that appears on the character cards used when playing, but now you get to see the artwork at full size. Some of the artwork will make your jaw hurt. Most of the art is truly exceptional, and people who like that Eastern-Western fusion style, with demons, knights with ridiculously oversized swords, and schoolgirls with scythes, may be tempted to pick up the book just for the pictures. However, it should be noted (and this sort of comes with the territory), some of the artwork is a little... erm... you know... Fruity. The front cover is a bit of a giveaway, as it features a blonde female warrior in a fetish outfit. She looks like she wants to kiss you, and kill you; and not necessarily in that order. Not every female character is portrayed this way, but there are certainly several pictures that some people might object to. Surprisingly, very little of the actual book contains rules; but the rules that are there completely change up the game. The stripped down rules from the starter sets are enough to get going with, but you will not be able to experience the full tactical and strategic elements of the game without using the rules from the book. 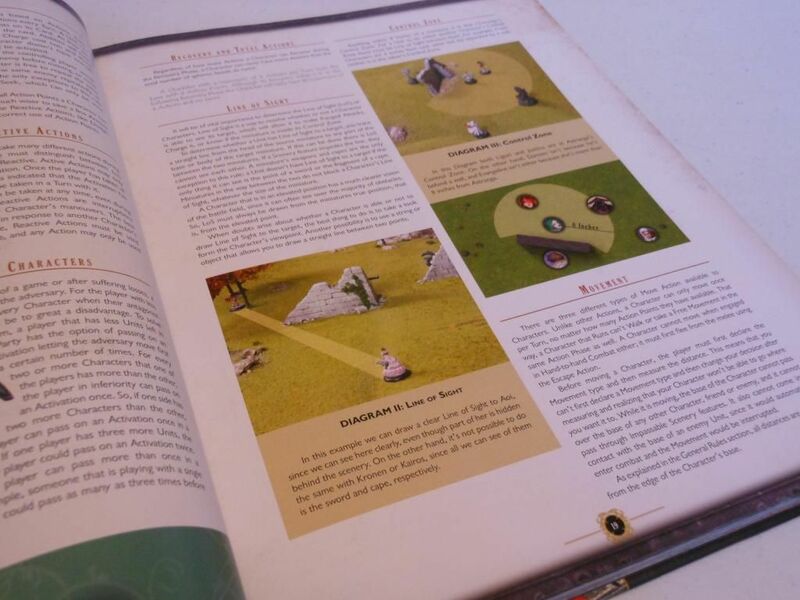 For example, the book contains complete rules for building warbands (and the advantages associated with building faction-specific warbands), and there are new rules such as "critical mastery" (which allows you to always hit when you roll a natural "10" on the dice) and "gnosis points" (a type of resource that allows you to roll more than one dice in order to get a better result). There are also many new actions included in the book, such as attacking an enemy by dropping on him or her from an elevated position. The whole rules section only covers about 30 pages, but those pages are crammed with good stuff that really opens up the game. The book also contains some basic scenarios, and complete rules for playing the game in the style of a board game (using a grid rather than terrain and a tape measure). There is also an extensive section that gives details of all the characters from "Saga I" and "Saga II" (basically, every character released up to the point the book was published). This section includes all the rules for those characters, which isn't strictly necessary as every character comes with a character card that has all the rules on it anyway, and also a brief amount of history, which many people refer to as "fluff." It is the fluff that I have the biggest issue with. There is not nearly enough information on the characters, and reading their biographies is often a bit confusing and creates a lot more questions than it answers. This is the same for the very brief world history, which condenses hundreds of years of war into a few short paragraphs, glossing over a lot of stuff that feels like it was way too important to be glossy. Even the short story that runs throughout the book does next to nothing to explain what the hell is going on. It doesn't help that the translation is not always great, and there are quite a lot of spelling mistakes and grammatical errors. The lack of really good quality fluff is a bit of a shame, especially as one of my main complaints when I reviewed the starters was the difficulty I had becoming invested in the characters because I didn't know anything about them. But still, you can't have everything; and I guess it takes a long time to create a world that is as fully fleshed out and convincing as (for example) the Warhammer world. Yeah, there are mechs too. Obviously. Overall, I think the book is a success. It's beautifully made, and beautifully illustrated; and the additional rules add a layer of depth that was sorely lacking from the rules available in the starter sets. I am happy to have a copy, I just have to remember not to leave it out on the coffee table when the vicar comes round for tea.